If you haven't already spotted the two heavily-armed men hidden in this picture, it could be curtains for you. 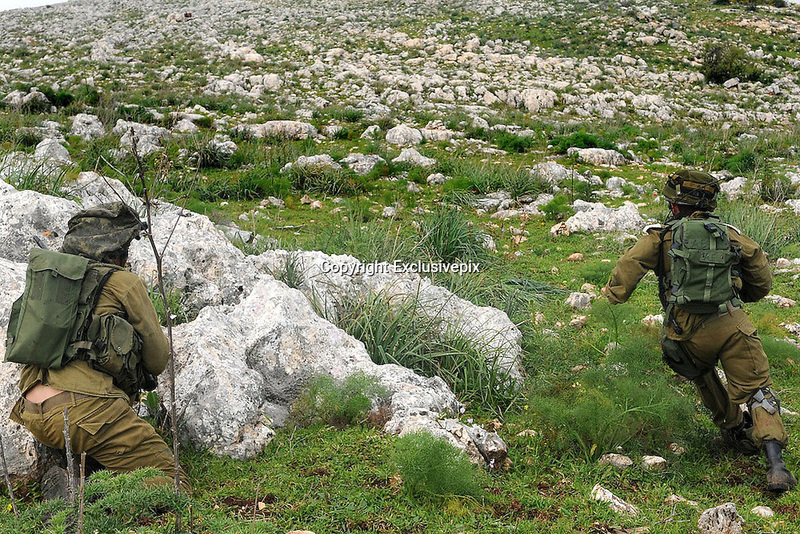 These elite Israeli army assassins, pictured on rocky ground in the north of the country, are trained to blend into the landscape so well you're unlikely to even know they're there. That is until you have a bullet in you. So, be quick because you only have a couple of seconds - at most - before they could pull a trigger. Founded in 1956, the Egoz reconnaissance unit of the Israeli Defense Force is a special unit trained in guerilla tactics. Its battalion is part of the Northern Command's Golani Brigade. Their training starts with basic exercises, then advanced exercises, and unit marches, after which each soldier is interviewed by Israeli intelligence to determine if he should be screened out from the second phase of training. It is in the second phase when recruits learn camouflage warfare plus various kinds of assaults, land navigation, jeep driving, counter-terrorism, parachuting, reconnaissance and the alpine warfare. Sometimes they operate in cities. But sometimes, as seen above, they hide on the hills. Watching. Waiting. So, we'll ask again, have you found them yet? There are two of them, they are camouflaged, and the picture below might help you out.